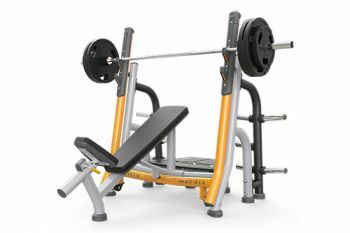 Using the breaker incline bench press that has 10 weight-store horns allows you to target muscles in the upper part of your chest, such as the pectoralis major, triceps brachii and anterior deltoids. This incline bench has a wide back pad that stabilises users during heavy lifts. Users can easily adjust their seat thanks to its ratcheting design. The urethane guards protect the Olympic bars from damage, reduce noise and provide a hand rest for spotters.